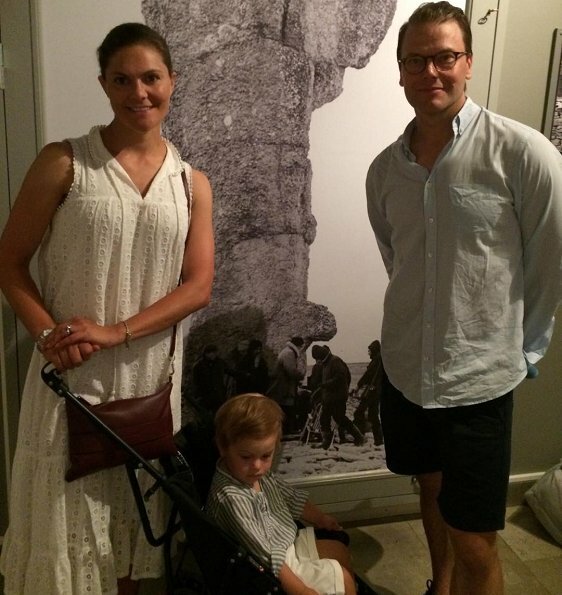 Crown Princess Victoria, Prince Daniel and their children visited Bergman Center in Fårö island on 25th July. Located on the island of Fårö, the Bergman Center is a cultural center that focuses on the life and artistic achievements of legendary Swedish director and writer Ingmar Bergman. At the photo Princess Victoria, Daniel and Oscar. Everyone in a nice summer outfit.Victoria s dress looks lovely. She has a little tan and no makeup but she looks fresh and rested. No smiling event for Oscar again. They seem to be such a nice family. I think Daniel is the best possible spouse to Victoria. I think she knows this :-)) I will never forget the words she spoke to Daniel on their wedding. And the loving gesture. They are blessed to have found each other. And we are blessed to get now and then a glimpse of their happy family life. Victoria and Daniel look fresh and young. Oscar still looks surly, I wonder why he very seldom smiles or looks happy like Estella and his parents. Daniel has a lovely smile.